Live the experience of studying in Costa Rica and supporting our country. We have several options to choose from. We suggest you to take one month of language classes before you start your volunteer program (not a requirement). 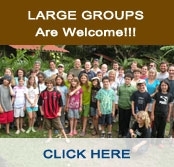 All positions will be set up after your arrival in Costa Rica. Medical service for students or professionals in the heath provider area, to work in local clinics or hospitals. Teaching English as second language in a local school, high school or we can also arrange a group for you to teach in our school campus (children or adults). Biological studies, or just supporting national parks, reserves and turtle protection entities. First aid, paramedic and office work at the Red Cross.